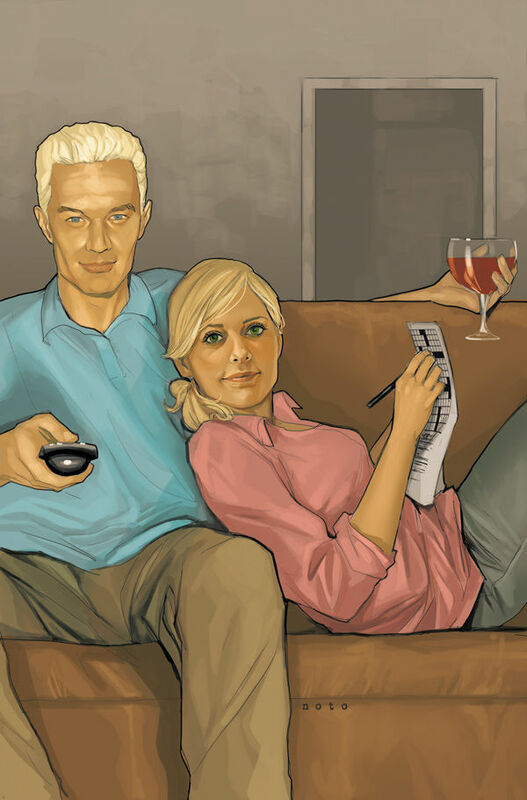 The Fellowship was fortunate enough to obtain a copy of BUFFY THE VAMPIRE SLAYER #7 from Dark Horse Comics. Andrew Chambliss wrote the story with art by Georges Jeanty. Buffy is trying to deal with the fact that she will never have a “normal” life. That’s what lead to her decision at the end of the previous issue (just Google it – I’m not going to spoil it). Therefore, she has moved out of the apartment she was sharing and has moved in with Spike. Meanwhile, Detective Dowling is getting first-hand experience dealing with the zompires. Just in time, Buffy and Spike show up to join the battle. You won’t believe the big shock at the end of the issue…a total WTH moment! And I’m not talking about Buffy finally realizing that Spike loves her. I was not a big fan of George Jeanty’s work from the Buffy Season 8 books, but the art looks better in this issue. Maybe he is more accustomed to the Buffy-verse, but to me there seems to be a difference. Andrew Chambliss has a great grasp of the characters. He was a writer on DOLLHOUSE… a Joss Whedon show so he knows the style and adds his own touch as well. BUFFY THE VAMPIRE SLAYER #7 is in comic book stores now or available at www.darkhorse.com.